Michelangelo Merisi da Caravaggio (1571-1610), Salome with the Head of St. John the Baptist (c 1607), oil on canvas, 114 x 137 cm, Palacio Real de Madrid (Palacio de Oriente), Madrid. Wikimedia Commons. It is most unusual, perhaps unique, for a painting to have changed the account of a significant event in history, and to have generated a popular archetype which has since pervaded many other stories across all the arts. In this and the next couple of articles I am going to trace what happened, as I ask who was responsible for the execution of the second most holy figure in the Christian gospels. The answer is a story in itself, involving revolution, decadence, and perverse sexual fantasy, and a cast of famous paintings, plays, and operas. For Herod himself had sent forth and laid hold upon John, and bound him in prison for Herodias’ sake, his brother Philip’s wife: for he had married her. For John had said unto Herod, “It is not lawful for thee to have thy brother’s wife.” Therefore Herodias had a quarrel against him, and would have killed him; but she could not: for Herod feared John, knowing that he was a just man and an holy, and observed him; and when he heard him, he did many things, and heard him gladly. And she went forth, and said unto her mother, “What shall I ask?” And she said, “The head of John the Baptist.” And she came in straightway with haste unto the king, and asked, saying, “I will that thou give me by and by in a charger the head of John the Baptist.” And the king was exceeding sorry; yet for his oath’s sake, and for their sakes which sat with him, he would not reject her. And immediately the king sent an executioner, and commanded his head to be brought: and he went and beheaded him in the prison, and brought his head in a charger, and gave it to the damsel: and the damsel gave it to her mother. And when his disciples heard of it, they came and took up his corpse, and laid it in a tomb. The short summary is that Herodias harboured a grudge against John the Baptist, as he had dared to tell Herod that he should not have married Herodias, who had been his brother’s wife. At Herod’s birthday party, Herodias’ daughter had danced so well that Herod had offered her anything up to half his kingdom as a reward. Herodias told her daughter to ask for the execution of John, and his head to be brought to her on a plate. Although very reluctant to do so, Herod was bound by his oath, so ordered the execution. When the dancer was presented with John’s head on a large platter, she gave it to her mother. Some additional detail was provided by Flavius Josephus in his Jewish Antiquities, book 18 chapter 5, who mentioned that Herodias’ daughter was named Salome, and confirmed that Herodias had divorced herself from her husband when he was still living, then married his brother. That also mentions that Salome married Philip, her cousin. On his death, she married Aristobulus, who I think was her second cousin. Josephus does not suggest any alteration to the account of John’s execution given in the gospels. In this article, I provide some examples of paintings which appear to show the narrative much as given in the gospel accounts, with Herodias being the person who instigated John the Baptist’s execution, to avenge his criticism of her second marriage. As with most martyrdoms, this is well-illustrated in manuscripts through the Middle Ages, but I will start my account at the beginning of the Renaissance, with Masaccio. Masaccio’s The Martyrdoms of St Peter and of St John the Baptist (1426) is one of the surviving panels from the large and complex polyptych altarpiece in the chapel within Santa Maria del Carmine in Pisa, from 1425-26. This shows the gruesome scenes of the inverted crucifixion of Saint Peter, and the beheading of Saint John the Baptist. The latter is in accordance with the gospel account above, showing none of those attending Herod’s birthday party, and a bowl ready to receive John’s severed head. 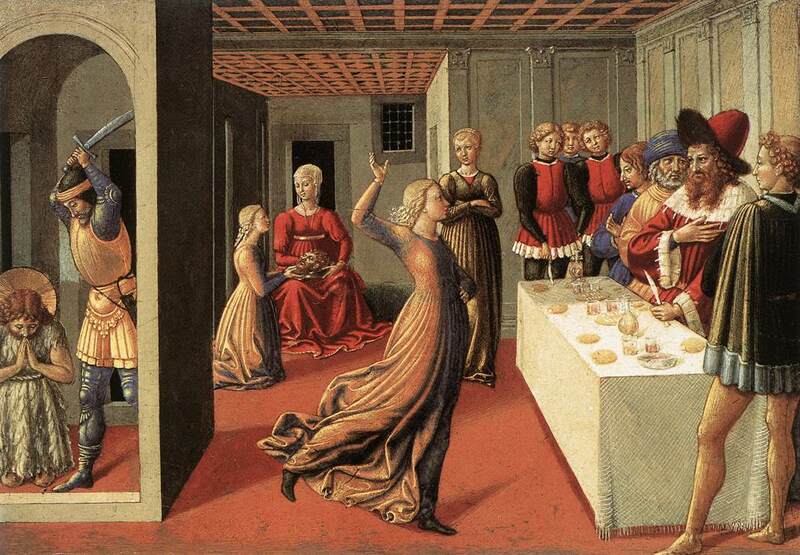 Benozzo Gozzoli’s The Dance of Salome (1461-62) provides an interesting account of events at the party, using multiplex narrative. Salome is shown twice in the single frame: once dancing in front of Herod, and again giving Herodias the head of John at the back of the room. The middle event in the chain, the beheading of John, is shown in a side-room at the left. Hans Memling (c 1433–1494), St John Altarpiece (1474-79), oil on oak panel, 173.6 x 173.7 cm (centre panel), Memling in Sint-Jan de Bruges, Brugge, Belgium. Wikimedia Commons. The left panel of Hans Memling’s St John Altarpiece (1474-79) shows the beheading of John the Baptist, with the executioner placing John’s head on a platter held out by Salome, who averts her eyes from its sight. Note that the eyes on John’s head and those of Salome are closed. Lucas Cranach the Elder (1472–1553), Salome with the Head of St. John the Baptist (Katharina of Saxony as Salome) (c 1510), oil on oak, 61 x 49.5 cm, Museu Nacional de Arte Antiga, Lisbon, Portugal. Wikimedia Commons. 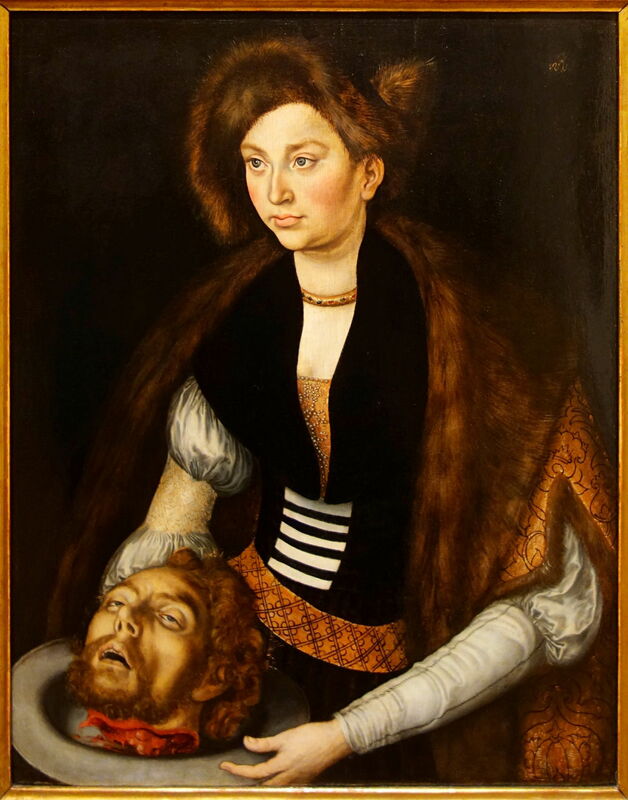 Lucas Cranach the Elder’s Salome with the Head of St. John the Baptist (c 1510) is a curious painting, as it has apparently been subtitled as casting Katharina of Saxony (1468-1524) in the role of Salome. Katharina married Sigismund, Archduke of Austria, in 1484, when she was just sixteen and he was 56 and regarded as senile. I can see no obvious reason for her to be used as the model, but she looks ahead and to the left, avoiding eye contact with the half-open lids of John’s head, whose face is pointed in the same direction. Jan Rombouts I (c 1480-1535) (attr), The Beheading of St John the Baptist (1500-1550), oil on panel, 166 x 70 cm, M van Museum Leuven, Leuven, The Netherlands. Wikimedia Commons. Multiplex narrative is used again in this painting attributed to Jan Rombouts I, The Beheading of St John the Baptist, from 1500-1550. In the distance, John baptises (possibly Jesus Christ); in the middle distance is Herod’s feast, and in the foreground the executioner places John’s head in the salver held by Salome. Her whole head is averted, and John’s eyes are closed. Titian (Tiziano Vecellio) (1490–1576), Salome (c 1550), oil on canvas, 87 x 80 cm, Museo Nacional del Prado, Madrid. Wikimedia Commons. Titian’s Salome (c 1550) is as sparse as Cranach’s painting of Katharina of Saxony. Salome holds the platter high and looks round towards the viewer, as if she is carrying it out to a full banqueting hall. The connections with and cues to the biblical story are few and becoming stretched, but he provides nothing to contradict the biblical account. This story became an obsession with Caravaggio in his final few years of painting. 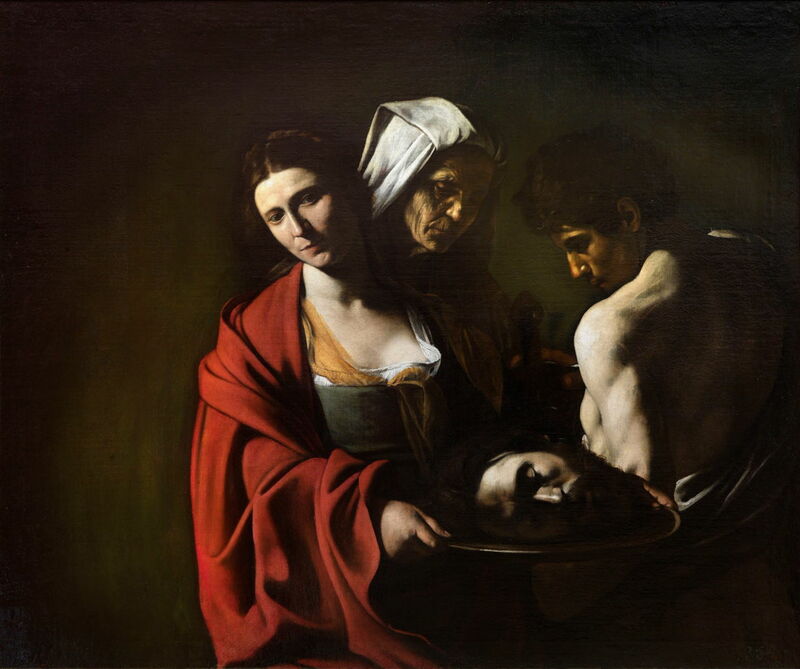 His first work, Salome with the Head of St. John the Baptist (c 1607), now in Madrid, shows the muscular executioner, Herodias, and Salome grouped tightly around John’s head (with its eyes closed). Herodias and the executioner look down at the head, but Salome looks decidedly uncomfortable, even distressed, and averts her eyes. 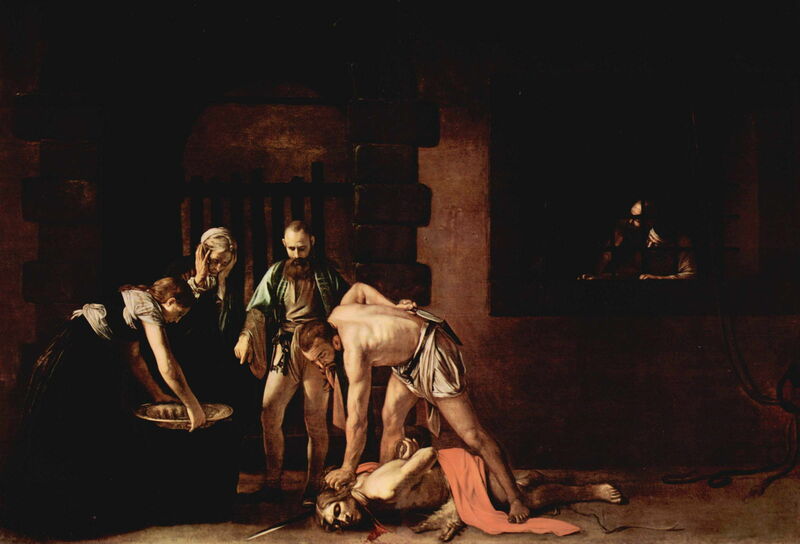 Michelangelo Merisi da Caravaggio (1571-1610), The Beheading of St. John the Baptist (1608), oil on canvas, 361 × 520 cm, Kon-Katidral ta’ San Ġwann, Valletta, Malta. Wikimedia Commons. In Caravaggio’s second painting, The Beheading of St. John the Baptist (1608), now in Malta, the executioner has already killed John, and is just about to lift his head onto the platter which Salome has put down in front of her. She looks down at her platter, and avoids looking at the corpse beyond. An older woman with her, presumably her mother Herodias, clutches the sides of her head in grief, which is puzzling. Others look from their cell through bars at the scene, and Herod’s agent stands behind the executioner, pointing down at the platter, to direct the head to be placed in it. Michelangelo Merisi da Caravaggio (1571-1610), Salome Receives the Head of John the Baptist (c 1609-10), oil on canvas, 91.5 x 106.7 cm, The National Gallery, London. Wikimedia Commons. 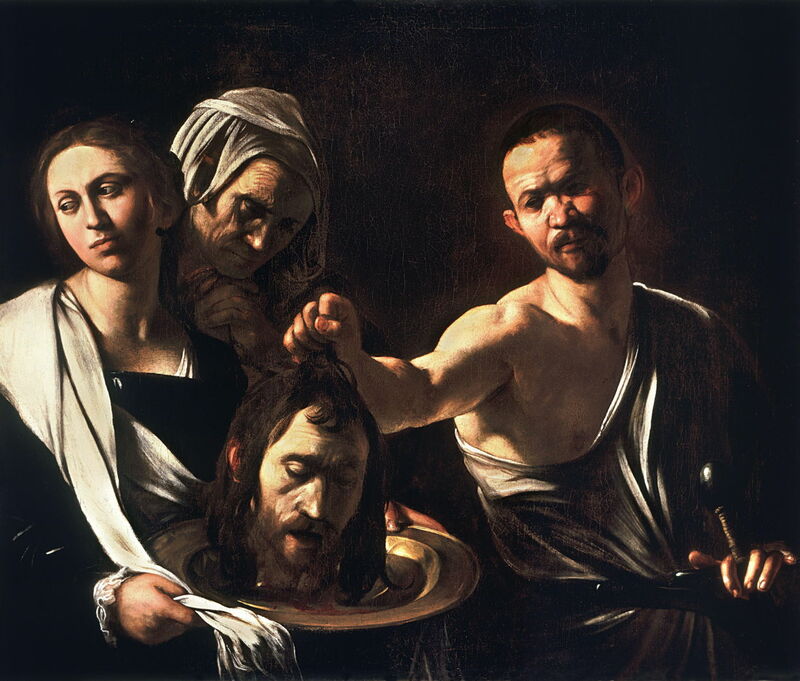 Caravaggio’s third painting, completed shortly before his death, is a more closely-framed variant of the first: in Salome Receives the Head of John the Baptist (c 1609-10), now in London, Salome averts her eyes as the executioner places John’s head on the platter. Herodias looks down at the head, but its eyes are closed and it too faces the viewer. Artemisia Gentileschi (1593–1653), Salome with the Head of Saint John the Baptist (1610-15), oil on canvas, 84 × 92 cm, Szépművészeti Múzeum, Budapest. Wikimedia Commons. Artemisia Gentileschi’s Salome with the Head of Saint John the Baptist (1610-15) omits Herodias, but shows the executioner placing John’s head on the platter held out by Salome. She looks at the head (this is possibly the first painting to show Salome looking at John’s face), but her expression gives little away, and although John’s face is pointed towards her, its eyes are firmly shut. Bartholomäus Strobel (1591–1647), Decapitation of Saint John the Baptist at Herod’s Banquet (c 1630-33), oil on canvas, 280 × 952 cm, Museo Nacional del Prado, Madrid. Wikimedia Commons. Bartholomäus Strobel’s long panoramic view of Decapitation of Saint John the Baptist at Herod’s Banquet (c 1630-33) concentrates on the grand banquet, with many ranks of nobles gathered there. At the far right, the executioner stands by John’s headless corpse, a large pool of bright blood on the ground where its head once lay. A young woman (who might be Salome) looks up to heaven, her hands clasped in prayer, while an older woman (presumably Herodias) chats with the executioner. Meanwhile John’s head has been brought out to Herod, who rises from the right end of the top table, to greet that salver. It is held by a woman in fine dress, but there are other candidates for Salome and even Herodias nearby. Bernardo Strozzi (1581–1644), Salome (after 1630), oil on canvas, 124 x 94 cm, Gemäldegalerie der Staatlichen Museen zu Berlin, Berlin. Wikimedia Commons. 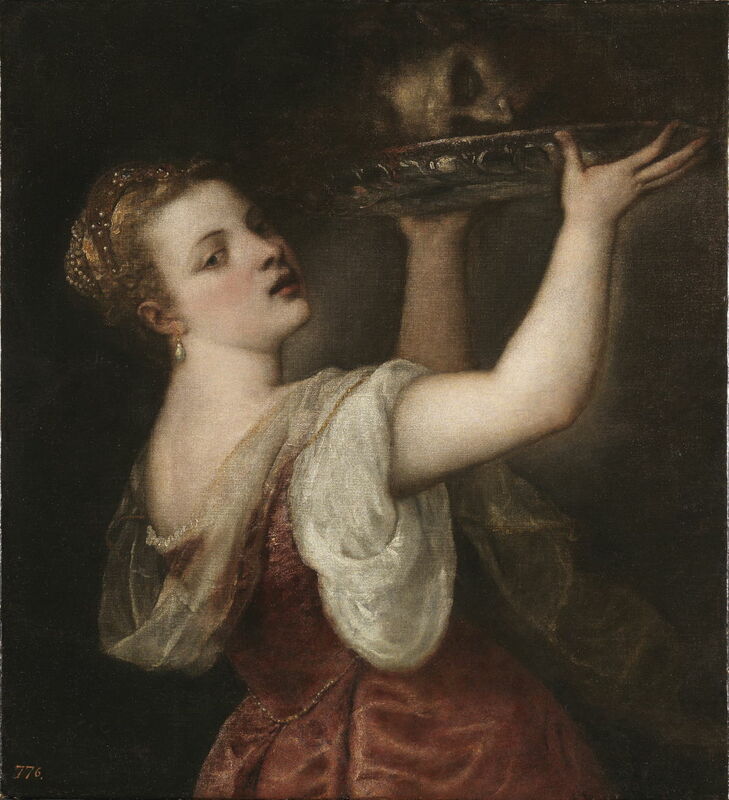 Bernardo Strozzi’s Salome (after 1630) features Salome and another woman who cannot – by her youth – be Herodias, but presumably must be Salome’s servant, and holds the platter on which John’s head rests. Its eyes are closed, although Salome is both looking at the head, and she holds a lock of its hair in her fingers. Although this is getting towards the margin of the biblical story, it doesn’t yet conflict with it. William Dobson (1611–1646), The Executioner with the Head of John the Baptist (c 1640-43), oil on canvas, 110.5 x 30.2 mm, Walker Art Gallery, Liverpool, England. Wikimedia Commons. William Dobson’s The Executioner with the Head of John the Baptist (c 1640-43) returns to the original version more solidly, as the executioner lowers John’s head onto the platter held by Salome. John’s eyes are closed, but Salome looks intently at his face, her facial expression quite neutral. 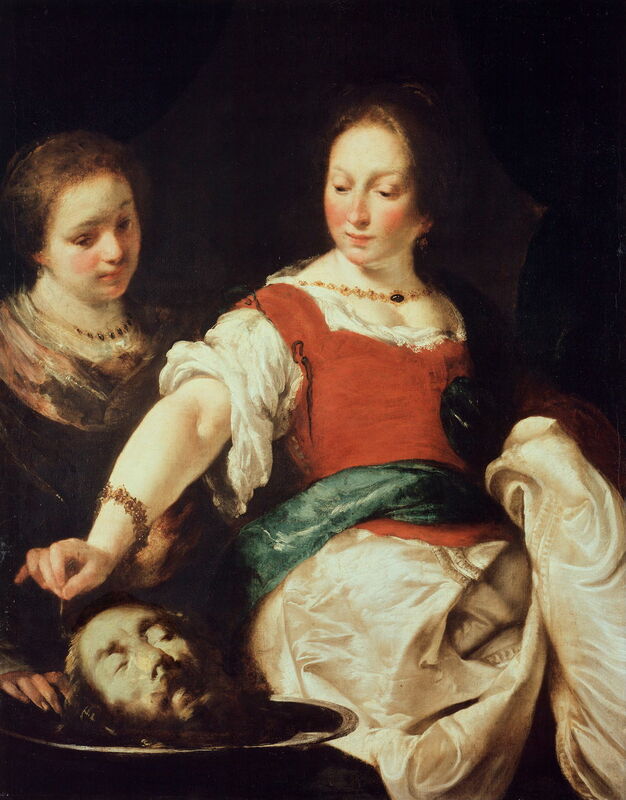 Behind her, Herodias also stares at the head, but her face does not show whether her vengeance is sweet: it too is surprisingly neutral in expression. The scene is lit dramatically by a boy holding a burning brand, facing into the picture plane. Subsequent paintings of this story add little to those above, until we reach the late nineteenth century, when there are two significant paintings to see. 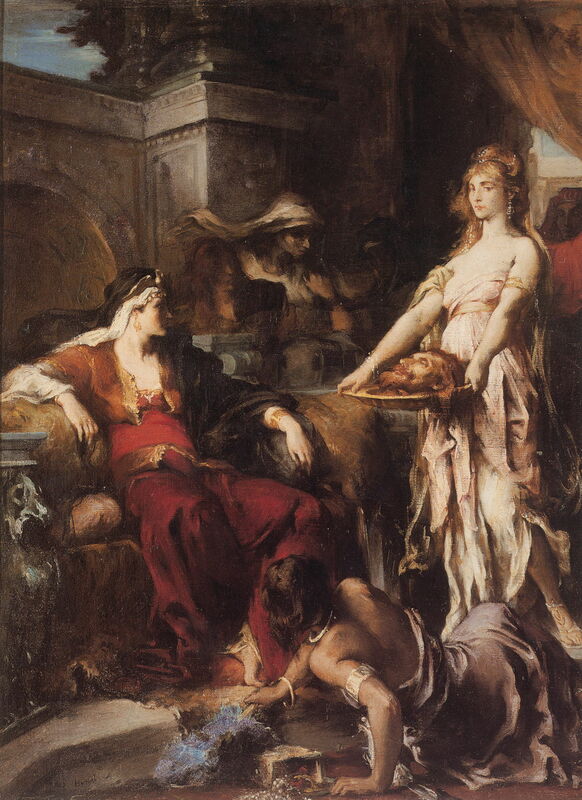 Henri-Léopold Lévy (1840-1904), Herodias (1872), oil on canvas, 287 x 235 cm, Musée des Beaux-Arts, either Brest or Nancy, France. Image by Vassil, via Wikimedia Commons. 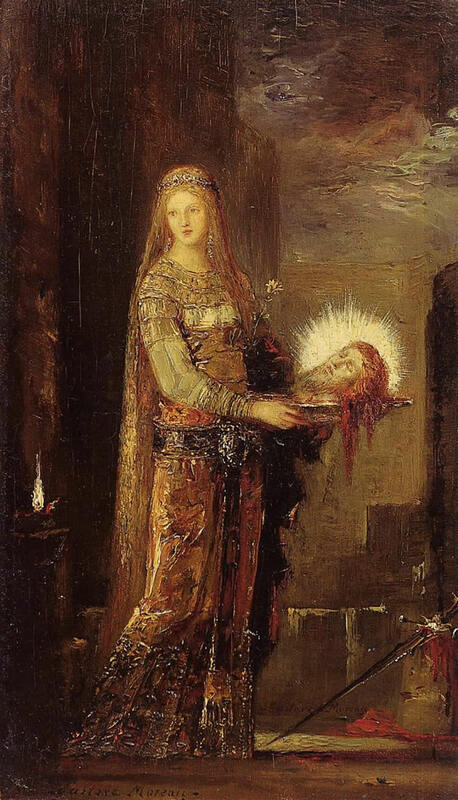 An acclaimed history painter at the time of Gustave Moreau, Henri-Léopold Lévy painted quite a different scene in his Herodias (1872) – whose title makes it clear that he adheres to the biblical story. 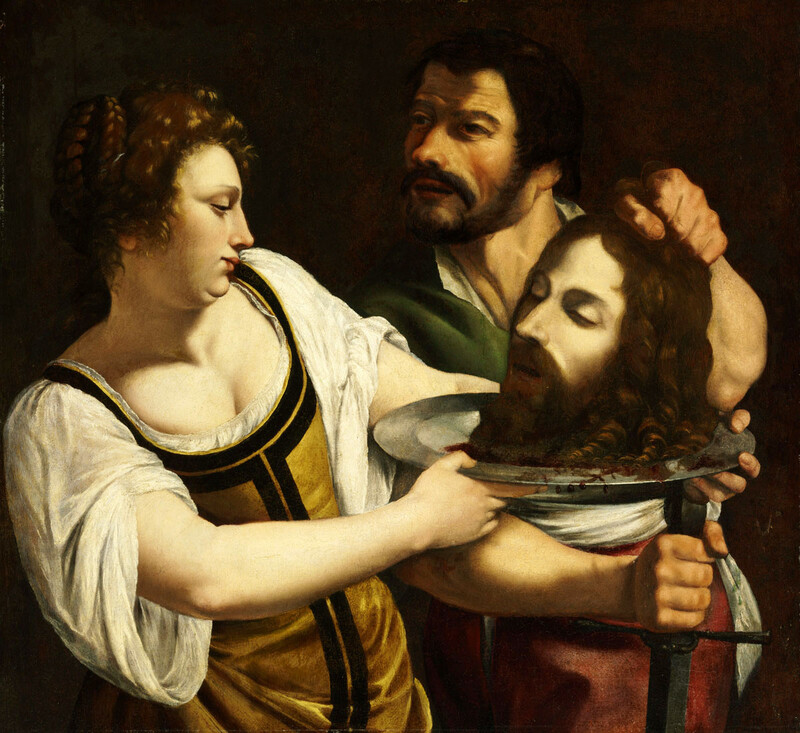 Salome holds the platter containing John’s head with her arms fully extended, and she averts her eyes. A youthful Herodias sits on Herod’s right side, and looks straight at the head. At their feet, a servant has fallen back and to the ground in shock at the hideous sight in front of them. During Gustave Moreau’s preparatory paintings for The Apparition (1876), he painted several different scenes from the story. This work appears to be one of his later preparatory paintings, showing Salome Carrying the Head of John the Baptist on a Platter (1876). Its single figure is Salome, who here is expressionless and if anything seems heroic. She carries the platter bearing John’s head, as if to take it to Herodias. The head oozes blood, which hangs in strings from its edge. Its eyes are closed, and Salome looks to the viewer’s left, her face expressionless. John’s eyes are also closed, but the head is surrounded by a bright gold spiculate halo. I make two general observations about the above paintings. First, with the possible exception of Lévy’s, all these depictions of Salome show her wearing modest dress, and do not portray her as licentious or provocative. This contrasts with her modern reputation as a femme fatale, and with the paintings in the following articles. 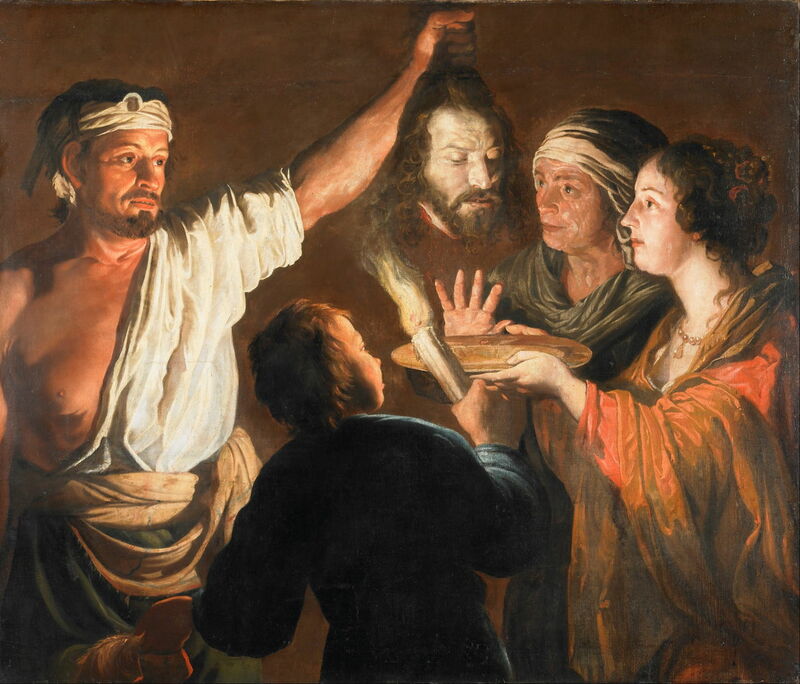 My other remark is that eight of the fifteen paintings show Salome collecting John’s head from the place of his execution, although the biblical account clearly states that the executioner brought John’s head back to the party from the prison, implying that Salome did not leave Herod’s and Herodias’ company during John’s execution. It would appear that those eight paintings varied the story in order to provide what the artist thought was a more appropriate setting for the painting, including in several instances the headless corpse of John the Baptist. The next article will look at paintings which are more ambiguous over the underlying story. Neginsky R (2013) Salome: The Image of a Woman Who Never Was; Salome: Nymph, Seducer, Destroyer, Cambridge Scholars. ISBN 978 1 4438 4621 9. Posted in General, Language, Painting and tagged Caravaggio, Cranach, Dobson, Gentileschi, Lévy, Masaccio, Memling, Moreau, narrative, painting, Rombouts, Salome, Strobel, Strozzi, Titian. Bookmark the permalink. Though you would have done more on Dobson, the English Painter since after watching a production on him on PBS he seems to be all but forgotten in England. Yes, Dobson has become obscure and forgotten. This is the only painting that I can find of his which isn’t a portrait, although I’m sure it wasn’t his only narrative work. He died young, and relatively few of his works seem to have survived.